I have a day of today (Flagday here) so I decided to make this thread about the Oil Control Valves=OCV. If you remove that bolt the strainer is located in that hole, but this one doesn't have it as I used it in my engine and the old one fell and got lost. As part of regular maintenance I would recommend cleaning the strainer every 30k. It is a pain to get to if you don't remove the alternator so plan it to do so when you change your drivebelt. ok, now where is the lift OCV? BOOST BOOST AND MORE BOOST!!!!! The Lift OCV and housing is located on the battery side of the head. To get to it it's wise to remove the battery, move the ECU aside and temporarily disconnect the hoses that run from the intake manifold to the valvecover. Just like the timing OCV, the Lift OCV also has a strainer. And in case someone is wondering, the timing and lift strainers are not interchangeable, neither are the OCVs on certain model years, I don't remember which though. I think the timing OCV has a slightly longer shaft also. Took me some time hehehe. Washed it with diesel. It helps if you have a soft paintbrush too. Last edited by GSBoek; 12-17-2008 at 07:33 AM..
Of course this thread would not be complete without adding the infamous VVT-i related noise. Excuse the poor quality vid I put on Putfile. Watch how the tractor noise goes away when I pull the VVT-i OCV plug. Last edited by GSBoek; 01-23-2011 at 05:07 PM.. Thanks for the post...I propose a STICKY for this one. I propose a STICKY for this one. Sticky it is, I'll also submit it to the 'Installs" section. Keep it stickied until it's in the installs section. I hate having too many stickies on the top of the main page. wait so if i got that noise theres nothing wrong? i always thought i had a valve knock in my GT. so if i clean that will it run smoother?and the clacking noise go away? and the diesel.is that a cleaning agent or are you talkin bout the gas? GSboek thanks for the sticky! has anyone noticed any changes in performance after doing this? In performance there was no notable change, however the engine was delivering the power notably smoother in the lower rpm ranges up to 3.5K rpm. This could be attributed to a better oilsupply to the OCV/VVT-i sprocket. Technically any noise that is so apparent is an indication of wear or slack or clearance issues in an engine. The engine might otherwise run well but it's hard to tell really what the longterm effects could be. I have been over this literally countless times, and all the bits help a little but don't eliminate the noise completely. When I cleaned that strainers it was the single most notable improvement in both noise supression and engine smoothness. Edit: Diesel is the cleaning agent yes. could you use masf cleaner(electrical cleaner) stuff becasue i am too lazy to go get diesel and is there any harm in leaving that plug in the video off as it made it that much quieter? "Who Needs Moral Fiber When You Have Carbon Fiber"
MAF cleaner should do it just fine. As far as driving with the plug off, the car will drive, but you ain't gonna have VVT-i adjustment anymore. so.... I don't understand. Why on earth would a hole being filled cause more noise. I have the same noise whenever the motors warm, and would like for it to go away. Any solutions? anybody? This is bugging me to death. very nice detail, i have this problem its shooting out the p1693 code, and my lift isnt working, BUT it works sometimes, sometimes i try it and it goes tatatata, like its misfiring, or fuel cut off, u know? and the dealer wants to charge me 405 for the fix, 140 for parts, 300 for labor, now i have nothing close to 400, im in debt actually, cuz ive borrowed some money here and there, so i cant fix this problem at the dealer. so i was thinking of maybe checking the ocv screen, since it works off and on... but, im scared that i might not be able to put back the stuff together...HELP? before you cleaned the ocv, did it make a clattering/rattling noise when accelerating also? would brake cleaner work? Last edited by GSBoek; 01-23-2011 at 05:10 PM..
for the lift ovc i've always use brake cleaner w/out chloride..seems to work just fine..iv'e done it more then one so far all is good..i've actually saw the lift ovc guide over on ecelica.com when it was alive..but they call it lift filter cleaning guide..basically the samething with different name..
Back with an 03 Matrix XRS. first of all... ive heard this on this website, "the dealer knows nothing on our engines!" they may know how to put things together, but when it comes down to it, they know squat! they told me my solenoid needed replacing, they were wrong! i replaced it... with no results, still no lift... they want 300 dollars to replace it, when a local mechanic replaced it in less than 30 minutes, for 30 $!!! now im positive it might be the ocv screen, and if not that, it might be the lift bolts ive heard... now, is my ocv gasket for sure gonna break if i open the housing? help please? Ya I heard the ticking when it was time to change oil. After changing oil it got better. all the time but some times it is louder. Last edited by wceli; 11-19-2007 at 09:24 PM.. I can still hear a slight ticking sound once you remove the vvti ocv filter, thats the same noise my car makes. not the tractor sound, but it sounds like a ticking, injector tick almost? have you been able to quiet that down aswell? Ok,screen was really visably clean after 79K,still noise. and rattle was still there above 3k RPM,does this mean that the OCV is no good ??? ?Also I noticed very little sludge at bottom of cyl head,it was NOT enough to even scrape with screw driver blade. I own a 2000 Celica GTS, 120,000 ticks on the clock that I bought used in January. I started getting an annoying rattling noise on heavy acceleration. After the Toyota dealer basically told me that there was nothing that they could do about the noise, I researched the problem on the internet , and I came to this site. After some exhaustive searching with the parts guy at the Toyota dealer, I found the Toyota part numbers for these strainers (at least for the 2000 GTS; I don't know if they're the same part numbers for different years/models). They were really cheap (less than ten buck for the pair), so I couldn't really be bothered with cleaning them! The lift OCV strainer was clogged solid, the timing OCV strainer was partially clogged. After the installation of the new strainers and a new belt and tensioner, I am happy to say that my rattling noise has all but disappeared. I just wanted to say thanks to GSBoek for all of the great info! I checked my OCV screen for the first time in 152,000 miles (never done before) after reading this thread and it was perfectly clean. very nice detail, i have this problem its shooting out the p1693 code, and my lift isnt working, BUT it works sometimes, sometimes i try it and it goes tatatata, like its misfiring, or fuel cut off, u know? and the dealer wants to charge me 405 for the fix, 140 for cars parts, 300 for labor, now i have nothing close to 400, im in debt actually, cuz ive borrowed some money here and there, so i cant fix this problem at the dealer. so i was thinking of maybe checking the ocv screen, since it works off and on... but, im scared that i might not be able to put tires back the stuff together...HELP? Nice photos and guides. Your post is useful information about cleaning the VVT-i & VVTL-i OCV Screen. I apply it in mine. Mine are very neat now. I have a strange problem that occurs with my ZZT231. 6) Fuel in my country is 95 but I add bottle of octane booster because of the low octane fuel we have here. When the temperature indicator reaches half on the temp indicator, the LIFT does not kick in. The sound of the engine changes but acceleration is very poor. Its very precise because as soon as the temp decreases a bit, the LIFT kicks in as per normal with big acceleration and after a few minutes of high engine loads which results in a temperature rise reaching halfway through the indicator the lift doesnt kick in anymore. I tried many things, cleaning the strainers, playing with the timing and fuel through the e-manage, trying different oil brand, but nothing worked. Somethime also when im driving, suddenly the car feels heavy as if I was pulling a big trailor, so I stop on the road side, switch off the car and start it again, and the problem is solved, I suspect the E-manage for that but im not sure. I would be very grateful if anyone could help me with that problem. ok i have this girl thats got a celica and it throw a code for ocv closed malfuntion is this the issue of this code? great write-up i was able to do both strainers and the Lift OCV but i couldn't get to the VVT OCV. i was wondering if its possible to take out the OCV valve without having to take out the radiator pipe thats blocking the valve from being taken out? Hi, newbe here but I also have ocv closed malfunction code that pops up when ever I push the motor over 6500 rpm does anyone know what causes this and how do I fix it? 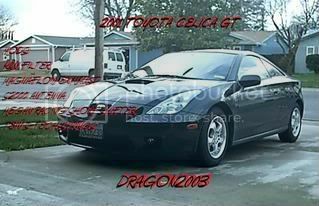 I have a 2000 Celica GTS. This is my first post and I really appreciate any information that some of the knowledgeable guys might be able to pass along. I had the same exact problem. The way I was able to correct it was by replacing the Oil Control Valve Lift filter. This is the one on the side by the battery. Mine was super dirty and clogged up. It was a pain to get out since I had never replaced it and it was so clogged up with gunk. 2000 Celica GT-S, Automatic, Short Ram Intake, Cross Drilled Slotted Rotors. Thanks for the info. I just went out and looked at the engine, found the valve. I' m curious as to how long it took to remove and clean the screen and did you also clean the valve too? I bought my first 2zz-ge powered car a few days ago on a whim. It came with a few simple CEL codes, that I was able to clear quickly - replace thermostat, replace spark plugs. and away went P0128 and P0301. Then on my first test drive where I pushed it over 6,000 RPM nothing happened, no acceleration, no boost, and back on came the CEL: P1693! That's what brought me here. This DIY is a godsend! I grumbled a little bit about having to remove the alternator again, after removing it the day before for the thermostat. I struggled a little bit pulling the vacuum pipe - until I figured out to grab it at the flange with big old pair of hose pliers for leverage. Then the VVT OCV came out like a charm, looking fairly clean. The oil strainer/filter slipped right out once its covering bolt was removed, also looking clean. Sprayed everything own with carburetor cleaner, and shot CC into the cavities, then put it all back together. Total time for this job one hour. Next the VVL OCV. Followed the DIY instructions, except for one little detail: on my engine (ZE133) the OCV has to come out of its housing before the top bolt of the housing can be turned. No biggie. With wiring harnesses and vacuum hoses out of the way, the OCV popped right out. This one was filthy. Disgusting. Caked with oil crud. The housing cavities were no better. And the little strainer was completely plugged. Be advised that this strainer has an integrated flat spring clip on the bottom. It takes a little jolt to pop it out, then it has to be popped back into place. The oil passages going into the head were also completely plugged. I picked the crud out with pick. I got everything as clean as I could, then put it back together. Total time one hour, with the better part of an entire can of carb cleaner used. Test drive results: at 6,200 RPM the car just leapt forward. I scared myself. And no more P1693. On de-briefing I am surprised at the difference in condition between the VVT OCV and its VVL counterpart. I'm not sure why one end of the engine is more susceptible to crud than the other. Distance from the oil pump? Tellingly, the oil pressure sender is mounted right on the VVL housing. So someone must have anticipated this. Oh yeah, there's a funny part that I almost left out: Before starting the job, I did make a phone call to the parts desk of a fairly well known supplier, to inquire about pricing and availability of the OCVs, in case they were needed. Even with the VIN in hand, the gentleman there tried to convince me that my car had only one OCV, not two. He sounded so certain, that had I not seen both of them with my own eyes, I would have believed him. On my car (ZE133 production date 05/2002) the two OCV's are identical and stamped with the same part number. I have another note to anyone who tries cleaning but still does not get lift. It is from this paper, Development of the High Speed 2ZZ-GE Engine, provided by the engineers at Toyota Motor Corp.
the high speed follower within 1 camshaft revolution. valve lift will not switch to high." This means eventually, with enough wear, bye bye lift for good. I can't think of overhauling the lift mechanism, so the solution is most likely replace the rocker arms. Just my opinion. What do I know. So I got a02 gts and it just got the vvtl I controller or gear replaced. Was running good but all of a sudden lost power in high rpms and check engine light came on. Now I don't have that extra vvtl I power after 6300??? may be a broken lift bolt? have u checked that? Did u loose the power right after the replacing parts, or it ran fan for a bit and now it doesn't lift? My problem is when my vvtli engages my car loses power for a few seconds and then picks up. I cleaned the both vvt and lift filters. I did not clean valves. My problem is the same like mendacious2's. My celica chokes before engages lift (weak lift). But now I don't have lift anyway, just a rev limit at 7k. New lift bolts, cleaned VVTLI OCV filter, but not the valve. And uncleaned VVTI filter yet. Any suggestions? I hope it's the valve, or maybe a not right oil type. Thanks! My problem is when my vvtli engages my car loses power for a few seconds and then pick up the snorerx. Mine does this too. I'm worried! Last edited by JarredLes; 01-30-2018 at 11:44 PM..